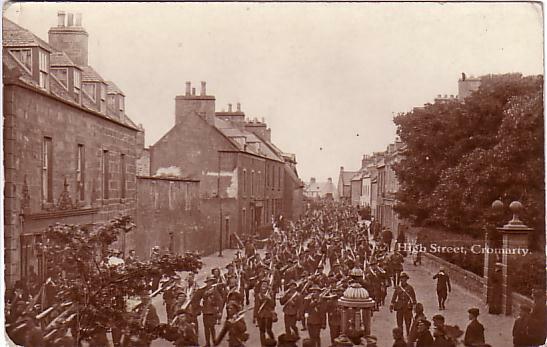 WW1 Soldiers in Cromarty High Street. The soldiers all appear to be moving in the same direction but are clearly not marching. I have no idea what the postcard commemorates although the lack of bunting and flags would indicate that its not the armistice. It is difficult to tell, but the soldiers look like they are wearing steel helmets - which dates the photo after 1915 - or slouch type hats, which were only worn by Dominion (Anzac) troops. The HLI in 1908 would have worn a peaked cap or Glengarry bonnet. My great aunt Annie Watson of 70, Big Vennel (father; John Watson, mother: Catherine Finlayson) married a Samuel Currie of Ayr, in 1915. He was a private in the 3rd. Seaforth Highlanders, stationed at Newton Camp, Cromarty. Annie remarried a John Fraser (also known as Duncan Mackenzie - do not understand the name change) of Inverness in 1919. I have presumed Samuel was killed in WW1. I wonder if he is in this photo? This is the same as picture #1220, only taken very slightly later, where there is a suggestion that they are Boer War soldiers. This is definitely the HLI during their three week walking tour through Ross and Cromarty in 1908. They arrived in Cromarty on the 25th July from Drumcudden and encamped just below Cromarty House. I'm doing a talk for the Dingwall History Society on the tour (would Cromarty be interested in similar? ), and would really appreciate a higher resolution version for the presentation! Urquhart of Dingwall took many photographs of them at different locations, but none from Drumcudden that I have found yet!